It's a big building, for sure. I'm using the Pegasus Hobbies Gothic City Building Large Set. It's a good number of pieces that pretty much let's you build what you want. More importantly, it's incredibly easy to put together. I added the flooring myself. I'm considering adding a bit more to the rear wall, but not sure yet. I still have quite a bit more work to do, but wanted to let the glue set. I wanted to make sure that a Rhino could make it into the ruins from at least one side. Hey, look, Dreadnoughts can get in as well! Looking down from the top. Obliterators on the roof, rawr! A local store today pulled out it's old 40k, Fantasy, and LotR stock and put it on sale at 50% off retail. Needless to say, I've been having a field day. Lots of older models, and it's missing a lot of stuff, but still, the selection is still pretty good. I picked up two Hammerheads and two Tau Battleforces, and tomorrow I'm going back for more. Keep in mind, it's all 50% off. I made the decision to go Tau for several reasons. 1. I wanted a ranged, mobile army. Currently I have a solid Nurgle army which I'm almost finished painting. With my Chaos Space Marines, I also have a lot of Khorne Berzerkers which I can build a Khorne army with lots of Land Raiders and lots of fearsome close combat death. Tau is a comletely different style of army, and something I look forward to playing. 2. I wanted a clean, regimented army that wasn't Imperial. Everyone plays Imperial. I might someday as well, but not today. Tau models are smooth compared to Chaos. The color schemes are precise, bright, and beautiful. The lines are clean, colors smooth, and everything is orderly. 3. I love the vehicles. After all the box-shaped rhinos, the Tau vehicles are beautiful models. I've been reading over the codex, and I'm pleased. I don't have many unit choices, but I have lots of options. I'm sure certain options are better than others, but I really want to focus on building a themed army so I've been avoiding reading forums and strategems and army lists. 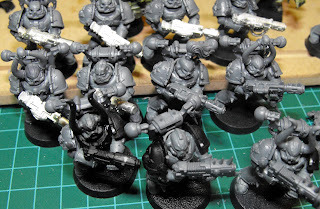 At some point I'll dip my head into them, but I'm interested in having a well round Tau force that works the way I want it to (a strong ranged force that will avoid close combat). I want mobility, I want troops, and I want a strong sense of theme. Even my Nurgle army, which is classic plague marines inside tin cans still holds strong to a theme. 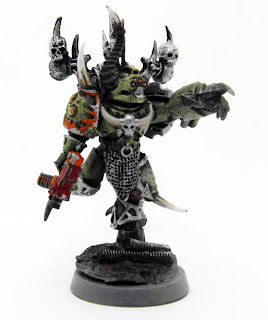 I can't help it if the options for a Nurgle based army are all essentially strong options. I have a 1,500 point game against Tyranid tomorrow. One daemon prince with Mark of Nurgle and Warptime, 4 Plague Marine squads of 5 men with meltas and champions with fists, and 2 obliterator squads of 3 obliterators each. Yeah, I know. Meltas against Tyranids!? But I want to try out meltas as I've been going plasma crazy lately and want to see how they feel with my style. I have a feeling my prince is gonna be busy, though. I finally got around to deciding what style I wanted to paint my realm of battle board with, and actually got done with painting it in a single day. I'll admit that I didn't choose anything difficult, but it fit with the style of my CSM army, and that was important to me. All things considered, I'm quite happy with it. The board is too red in the picture, and the bastion is to white. The contrasting green bastion and army beside the red and black ground makes for a very interesting color scheme. I love it. 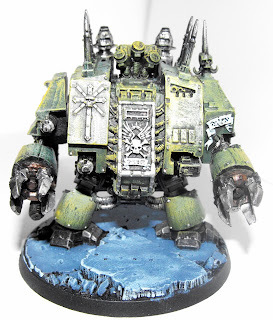 I love my Chaos Dreadnought. He looks cool. 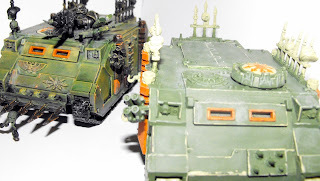 Two close combat weapons, heavy flamer, twin linked bolters, and a nurgle-themed paint job. But as far as effectiveness goes, he's been a thorn in my side. I'd love to field him, but without a doubt, I've suffered so much every time I've fielded them. In my last two games, my close combat dreadnought has been less then effective. In fact, he's killed more points on my side then on my opponents side. So, as much as I like the looks of him, I can't field him if I want to be effective. I played a small 1000 point game yesterday against space marines, and he was a waste of 105 points. Two rounds I rolled a 1, with the first round luckily not causing damage because he was strategically placed and troops were still in rhinos. A third round I rolled a 6, but since he had been immobilized, it didnt' do anything adverse. But he was immobilized by then anyways. The second roll of a 1 caused the death of two of my plague marines. That was fun. The other problem is the predator. In the tyranid battle, it was taken out first round with no chance for survival. In the space marine game, he did some damage, but not much. The question I have to ask myself is if he was really worth it. He did take some fire, but did he cause much damage? On a side note: Must remember to roll Warp Time checks at the start of rounds!